Lock in a great price for Anastasia Hotel – rated 8.6 by recent guests! Staff friendly and accommodating. Excellent value for money. Rooms were higher spec than expected, half board option with food better than average. Very friendly staff. Hotel and grounds kept very clean and well maintained. Ottimo albergo tutti molto disponibili Michele era il nostro punto di riferimento abbiamo mangiato benissimo complimenti allo chef. Il mare è a pochi minuti a piedi ed è cristallino la spiaggia di sabbia; tutte le mattine le persone del posto passano con cesti di frutta e ciambelle con e senza cioccolato l ombrellone con 2 sdraio li abbiamo pagati 5€ direi super economico. Le camere sono semplici ma c è tutto l occorrente, ottima la pulizia e a giorni alterni il cambio degli asciugamani. Alla sera sempre spettacoli bellissimi. È come essere in un villaggio. Ci siamo trovati benissimo. Ci ritornerei volentieri. Aamiainen oli monipuolinen ja herkullinen. Hotellin alueella oli paljon aktiviteetteja lapsiperheelle. Henkilökunta todella mukavaa ja ilmapiiri brittituristeineen myös kiva. Anastasia Hotel This rating is a reflection of how the property compares to the industry standard when it comes to price, facilities and services available. It's based on a self-evaluation by the property. Use this rating to help choose your stay! Anastasia Hotel enjoys a privileged location at the bottom of a hill in Stalis, just 1,500 feet away from beaches. Anastasia consists of 13 different buildings in a total area of 28 ft². The buildings are a modern, family-run complex, surrounded by trees and green gardens. 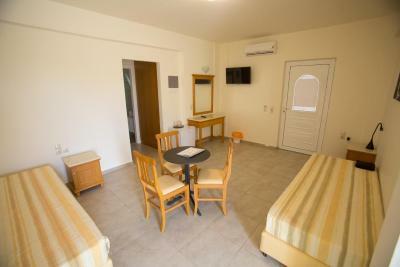 Rooms are simply decorated and furnished. They all include a furnished terrace or balcony that looks out to swimming pool, gardens or the sea. They come with a fridge, hairdryer and satellite TV. Electric kettle and safety boxes are also available upon surcharge. There is a restaurant and bar located by the pool. Guests can enjoy meals after taking a swim in the outdoor pool. A buffet breakfast can also be enjoyed daily at the dining area. Anastasia Hotel's friendly staff offer traditional Cretan hospitality 24 hours of the day and can offer tips on what to see and do around the north east of the island of Crete. When would you like to stay at Anastasia Hotel? Simply decorated and furnished, this room opens to a furnished terrace or balcony that looks out to swimming pool, gardens or the sea. It comes with a fridge, hairdryer and satellite TV. Electric kettle and safety boxes are also available upon surcharge. 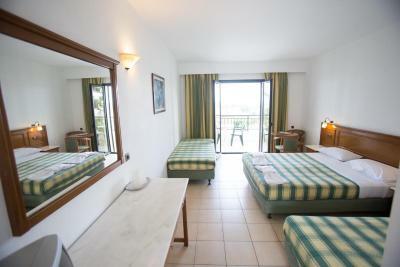 Offering views over the pool, the garden or the sea, this air-conditioned room opens to a furnished terrace or balcony. It comes with a mini fridge and satellite TV. Electric kettle and safety boxes are also available upon surcharge. 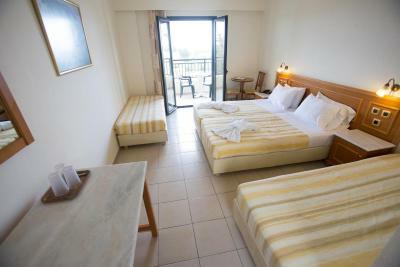 This twin/double room has a balcony, satellite TV and soundproofing. Family run Hotel, the best choise for couples and families looking for relax in a nice clean hotel with friendly staff and high quality meals. House Rules Anastasia Hotel takes special requests – add in the next step! Anastasia Hotel accepts these cards and reserves the right to temporarily hold an amount prior to arrival. Evening entertainment was sometimes very loud and intrusive so you couldn't escape it. It could also go on late (until midnight). In addition, I personally prefer not to have music at meals. Would like fresh coffee at breakfast and more local dishes at dinner. Kettle in room as standard. Tap water available at tables.